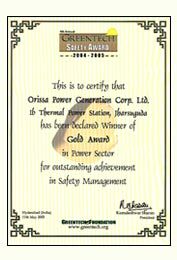 OPGC received "Greentech Safety Gold Award (2004-05) in Power Sector" for outstanding achievement in Safety Management at ITPS. On behalf of OPGC, Mr. P.K. Mohapatra, Manager (Civil) & I/c Environment Cell & Mr. S.K. Mishra, Manager (Electrical) &Team Leader (CHP) received the Award at Hyderabad on dt.11.5.2005.